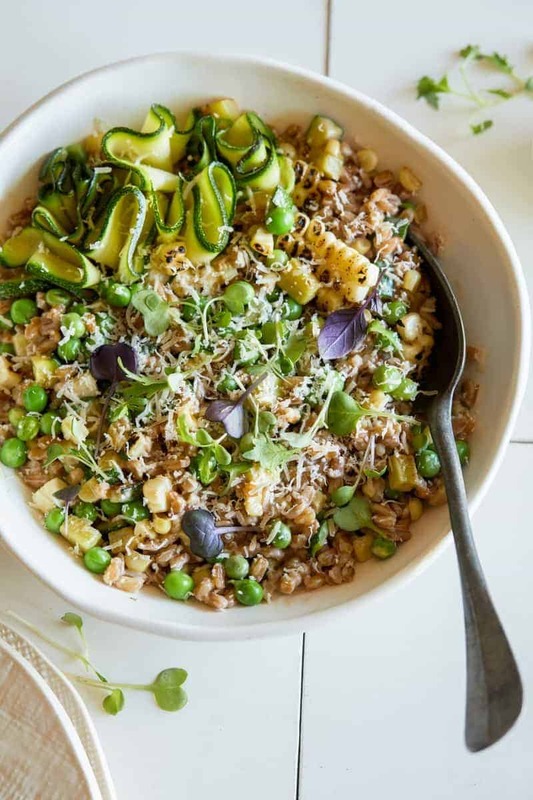 Today we have this pretty and delicious summer Zucchini, Corn and Sweet Pea Farro Risotto that uses all these great seasonal ingredients to make this pretty dish. It is one of those versatile dishes you could make as a side, or even as a main that is light and fresh but won’t leave you hungry. You could even add a little roasted chicken on top and that would probably make it a really yummy lunch. Recipe below! 1. Place a large skillet over high heat and add 1 tablespoon oil. Add diced zucchini and corn and slightly char/sauté for 2 to 3 minutes. Season with salt and pepper and transfer mixture to a small mixing bowl. Set aside. 2. Pour remaining oil into the large skillet and place over medium-high heat. 3. Add shallots and garlic and sauté for 2 to 3 minutes. 4. Reduce the heat to medium, add farro and toast for 4 to 5 minutes until fragrant, frequently stirring. Lightly season with salt and pepper. 5. Deglaze pan with the wine and stir. Allow the liquid to almost completely evaporate. 6. Ladle hot stock over farro mixture until barely covered. Allow mixture to simmer, stirring frequently. Once half of the liquid has evaporated add another ladle of stock and continue stirring. 7. Once all broth has been used and grains have softened, but are still chewy to the bite, stir in the mascarpone and 2 ounces of grated Parmesan. Season with salt and pepper. 8. Stir zucchini, corn and peas into the farro risotto and adjust seasonings. Top with remaining parmesan, zucchini ribbons and micro greens. Serve. I can only find pearled farro nearby–how would you adjust the recipe? Less broth?